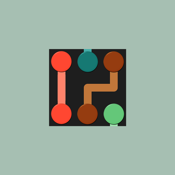 Connect: Classic is a puzzle game also known under the name of numberlink/arukone, but what really makes the game to stand out is the minimalistic user interface, with clean graphics. You can easily find what you’re looking for, whether it's the level packs, the settings or the store. The game is free to download and it has 1500 free levels organised by board size(from 5x5 to 14x14) and difficulty(easy, medium, hard). Hints are available if you ever get stuck.You get 5 free hints when you install the game. More hints and additional 1500 levels organised as 10 packs are available for purchase. 20 gamecenter achievements with a total of 610 points(305 from free packs, 305 from premium packs) are available for each pack you complete perfectly. - Try to enjoy the game using various devices.